Dogs have been shown to discriminate between human facial expressions, and they seem to use human emotional communication to regulate their behaviour towards an external object/situation. However, it is still not clear (1) whether they just respond to the emotional message received with a corresponding increase/decrease in their level of activation or whether they perceive that the emotional message refers to a specific object, (2) which emotional message they use to modify their behaviour (i.e. whether they are following the positive message or avoiding the negative one) and (3) whether their familiarity with the informant has an effect on the dogs’ behaviour. To address these issues, five groups of dogs were tested in two experiments. The first group observed the owner delivering two different emotional messages (happiness and fear) towards two identical objects hidden behind barriers, and the second group observed the owner delivering the same emotional messages but with no-objects present in the room. The third and the fourth groups observed the owner delivering a happy versus a neutral, and a negative versus a neutral emotional message towards the hidden objects. Finally, the fifth group observed a stranger acting like the owner of the first group. When the owner was acting as the informant, dogs seemed to be capable of distinguishing between a fearful and happy emotional expression and preferentially chose to investigate a box eliciting an expression of happiness rather than of fear or neutrality. Dogs, however, seemed to have greater difficulty in distinguishing between the fearful and neutral emotional messages delivered by the owner and between the happy and fearful expressions delivered by the stranger. 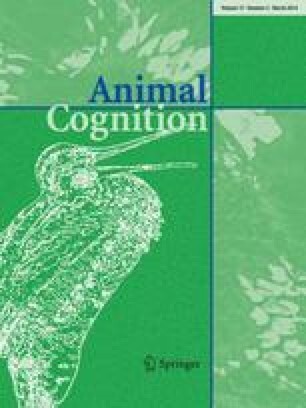 Results suggest that dogs have learned to associate their owners’ positive emotional messages to positive outcomes, and hence use their communicative messages to guide their actions. However, negative emotional messages and those delivered by strangers are not as clear to dogs. The online version of this article (doi: 10.1007/s10071-013-0668-1) contains supplementary material, which is available to authorized users. This research was supported by funds from the Università di Milano to Sarah Marshall-Pescini and Emanuela Prato-Previde and a doctoral grant from the same University to Isabella Merola. We would like to thank all the owners and their dogs that participated as volunteers. This research complies with the current Italian laws on animal welfare. 2 Akita inu, 1 Basenji, 1 Bichon Frise, 1 Border Collie, 1 Boxer, 2 Epagneul Breton, 1 Cau de agua, 1 Cavalier King Charles, 1 Dobermann, 2 Flat coat retriever, 1 German Shepherd, 5 Golden Retriever, 1 Australian Kelpie, 4 Labrador Retriever, 1 Pinscher, 1 Rhodesian Ridgeback, 2 Setter Irish, 1 Terranova. 2 Beagle, 1 Bolognese, 1 Border Collie, 1 Italian hound, 1 Breton, 1 Cirneco dell’Etna, 3 Golden Retriever, 4 Jack Russell, 2 Labrador Retriever, 2 Poodle, 1 Pinscher, 1 Rottweiler, 1 West highland terrier.